Thank you to Justine Richardson, manager of The Priory, who has made one of these amazing Owl Babies story sacks for each nursery. 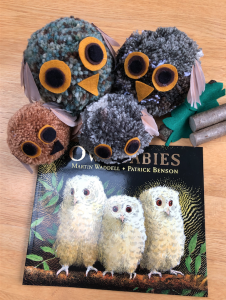 Owl Babies by Martin Waddell, illustrated by Patrick Benson, is a favourite book and Justine has created really amazing cosy, cuddly owls for practitioners to use to bring this book to life with the children. Reading stories is a great way to help children develop vocabulary and understanding. Thank you to Justine for sharing your amazing creative talents with us all.